When was the last time you restriped your parking lot? When was the last time you had your parking lot repaved? How about restriping your parking lot? For many commercial property owners, these job is long overdue. Dull parking lot lines reflect poorly on a business and can also put people in harm’s way. Keep reading and discover a variety of reasons why you should restripe your parking lot in 2019! 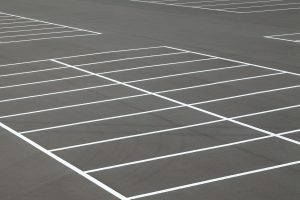 If you want to keep your parking lot as organized as possible, you need to keep it well-striped. It is imperative that customers know where they are permitted to park and which directions they can enter and exit the area. Your parking lot says a lot about your business. It creates a first impression for your customers. By restriping your parking lot, you are showing your customers that you care about their experience. Think of it as an investment that will draw customers to your business. There are many people who simply won’t go certain places because the parking situation is terrible. Don’t allow this to be the case for your business. Safety always needs to be a top priority for any commercial business owner. Faded parking lot lines can endanger drivers who are unable to see them. By restriping your parking lot, you will keep your customers safe and follow all regulations. One of the best ways to maximize your parking lot area is to restripe it. You may be amazed how you more effectively you can utilize your parking space by repositioning the lines. By restriping it, you may be able to create several more parking spaces. Customers appreciate that you care about their experience. Many businesses put a lot of care and consideration into the interior of their properties but do not put nearly the same kind of attention to the exterior of their property. To provide the best customer service possible, you need to keep your parking lot in tip-top shape. This entry was posted on Friday, February 1st, 2019	at 8:49 pm	and is filed under Asphalt Paving	. You can follow any responses to this entry through the RSS 2.0	feed. Both comments and pings are currently closed.